M: 6:30-8 a.m., 10-11 a.m.
W: 6:30-8 a.m., 10-11 a.m.
Senior Professional in Human Resources (SPHR). Completed and passed all certification requirements for the senior level of certification through the National Society for Human Resource Management (SHRM) in June, 1994. Completed a recertification in June 1997. In February 2000, received the Certified Professional for Life designation. 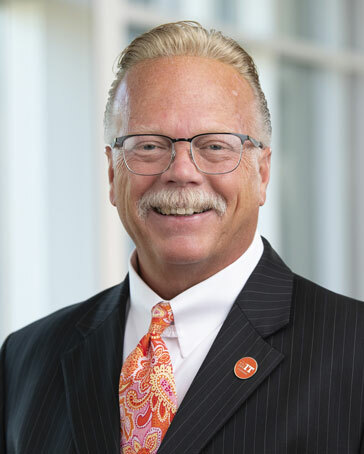 1989-Present: Professor of Business, Indiana Tech: As the senior faculty member within the College of Business, I teach Undergraduate and Graduate courses, within the traditional college setting, the accelerated degree programs, and within our online delivery program as well. The courses that I have taught include Advertising, Business Ethics, Business Law, Entrepreneurship, Executive Management, Human Resource Management, International Management, International Marketing, Introduction to Business, Labor Relations, Management, Marketing, Organizational Behavior, Purchasing, Retailing, Salesmanship, and Strategic Planning. In addition, I am a faculty mentor for the freshman class, the advisor to the Sigma Phi Epsilon Fraternity, the advisor to the SHRM student organization, and a sponsor to a variety of student events. Promoted from Assistant Professor to Associate Professor in 1997 and to Full Professor with tenure in 1998. Served as the Chair of the Department of Business Administration for the 1998 and 1999 semesters. 1995-Present: Consultant: I consult on a regular basis with local organizations. Topics have included Entrepreneurship Development, Human Resource issues, Marketing Research project development, and Strategic Planning formulation. 1986-1989: Facilitator, Indiana Wesleyan University: I was a facilitator for the LEAP Program (Leadership Education for Adult Professionals). I taught both graduate and undergraduate levels. The courses that I taught included Corporate Culture, Executive Management, Marketing, Organizational Behavior, and Personnel. 1981-1989: Manager of Building Services, North American Van Lines: I was responsible for the direction and management of the Cafeterias, Company Store, Fire Prevention, Janitorial Services, Pest Control, Security Services, Special Projects, and Supply Warehouse. During my first year I instituted a program to take the Janitorial and Security services from outside vendors to in–house employees. This program generated a first year savings of $250,000 which has been realized each year since. I wrote the procedures and job descriptions for each position in all areas of my responsibility. In addition, I set up an ongoing training and cyclical review program. I had 84 people under my area of responsibility, for which I had final decision authority for replacement hiring and reviewing. The nature of this position required daily interface with the executive staff, owner operators, and many city and county offices. I was also the acting controller for a $2,000,000 annual budget and I prepared all of the forecasts and analyzed the capital expenditures for the Facilities Division. 1977-1989: President, W & W Cleaning: In 1977, I began a cleaning and janitorial service, with a goal to pay for my college education. I accomplished this goal and the profits from this business also paid for my two brothers’ college education. I started with a box of business cards and made cold calls to sell my service. I performed all of the duties, including the cleaning, promotion, and bookkeeping as the business grew. Although this business is comparatively small it has developed into a very successful venture, expanding into real estate and property management. Currently my family members run the operations for this business. Developed and copyright protected The Program Planning Wheel, December, 1995. Presented a paper at the 1996 Midwest Research-To-Practice Conference at the University of Nebraska. The paper was co-authored with Peter Murk and published in the conference proceedings; title: The Program Planning Wheel–The Son of S.A.M. Co-authored a paper with Peter Murk, Juan Carlos Judikis, and German Cutz. This paper was presented by Peter Murk at the Sixth International Conference on Marketing and Development at Black Sea University, Mangalia, Romania, July 1-4, 1997. This paper was published in the conference proceedings; title: Program Planning Wheel: Value Added Performance. Presented two papers at the 1997 Association of Management and International Association of Management’s 15th annual conference, held in Montreal, Quebec, Canada. Both papers were published in the conference proceedings. The titles of the papers are: The Adonna Brick Supply Company Case and Program Planning—A Successful Theory to Practice Approach. The program planning paper was co-authored with Dr. Peter Murk. Presented a paper at the 1997 AAACE conference: Program Planning the fifth ‘P.’ This paper was co-authored with Dr. Peter Murk. My dissertation, A Study of Faculty and Student Perceptions Regarding Cheating Behaviors at a Small Private College in Northeast Indiana, was published with UMI in 1998. Co-authored a paper with Peter Murk titled, The Planning Wheel: Dealing with Decisions and the Internal and External Forces. This paper was published in Economic Development Review, 1999, vol. 16 issue 2, p. 39-45. Presented a paper at the 2003 Fort Wayne College Dean’s Conference, held at IPFW. Topic: What Motivates College Students to Cheat. Invited back to present at the 2004 Conference on the same topic. Presented a paper at the 2005 Teaching Professor Conference, held in Schaumberg, IL. Topic: What Motivates College Students to Cheat. Invited Presenter at the 2006 Teaching Professor Conference, held in Nashville, TN. Topic: What Motivates College Students to Cheat. Invited Presenter to the faculty of IPFW, February, 2008. Topic: What Motivates College Students to Cheat. Invited Presenter to the 2011 SHRM National Conference: Presented a session on HR Trends, with Dr. Ken Rauch, during the Student Conference Faculty Track. Invited Panel Member to the 2012 North Central SHRM Student Conference, held at Michigan State. Topic: Hot Topics in HR. Invited Moderator to the NIHRA 2012 Conference. Topic: Best Practices in HR. Invited Keynote Presenter, Indiana University, Bloomington. Topic: Are you Interview Ready?” September 2012. Invited Moderator to the NIHRA 2013 Conference. Invited Keynote Presenter, 125th Geological Society Convention, Denver, CO. Topic: Are you Interview Ready?” October, 2013. Invited Moderator to the NIHRA 2014 Conference. Invited Moderator to the NIHRA 2016 Conference. Invited Moderator to the NIHRA 2017 Conference. Invited by SHRM to be a Scenario/Question writer for the SHRM certification exams, June 2018. 1993: Summer Course Development Grant: Lilly Endowment, Inc.
SHRM Founding Student Chapter Faculty Advisor 1995.